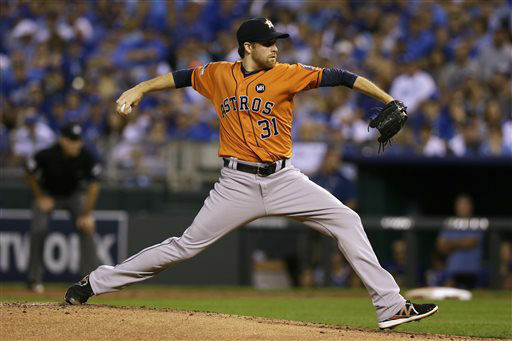 HOUSTON -- Collin McHugh and the Houston Astros beat the Kansas City Royals at their own game Thursday night, relying on sharp pitching and stingy defense for a 5-2 victory in the opener of their AL Division Series. 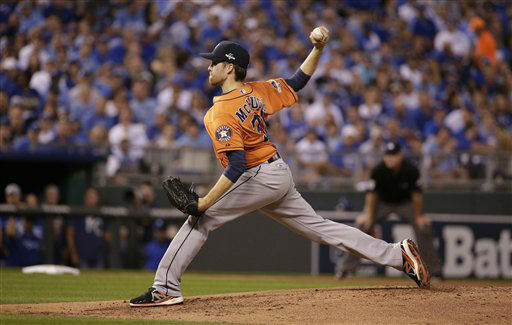 McHugh (1-0) allowed four hits, including a pair of solo homers by Kendrys Morales, while pitching around a 49-minute rain delay. The right-hander lasted six innings before turning the game over to his bullpen, which scattered three runners over the final three frames. 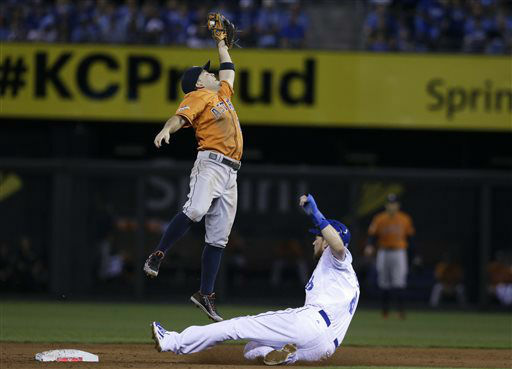 Tony Sipp, Will Harris and Oliver Perez got the game to Luke Gregerson, part of Oakland's wild-card collapse in Kansas City last year. He handled the ninth to earn the save. 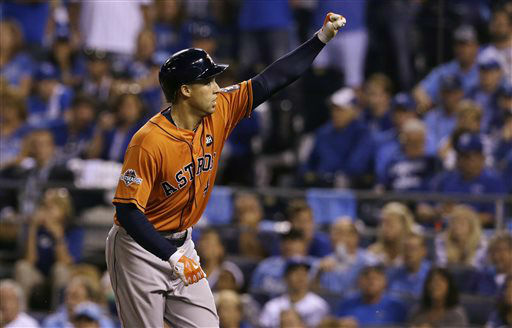 George Springer and Colby Rasmus went deep for the homer-happy Astros, but they also scored via the same sort of small ball the Royals used in reaching the World Series last season. 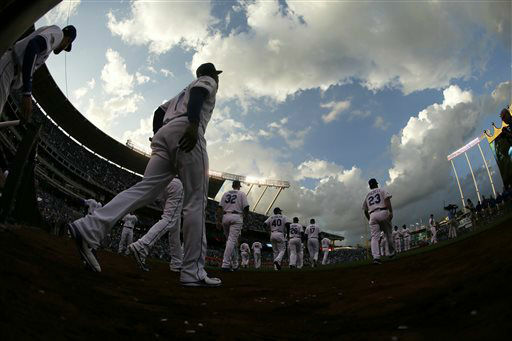 Yordano Ventura (0-1) yielded three runs on four hits and a walk in two innings for Kansas City, but did not come back following the delay. 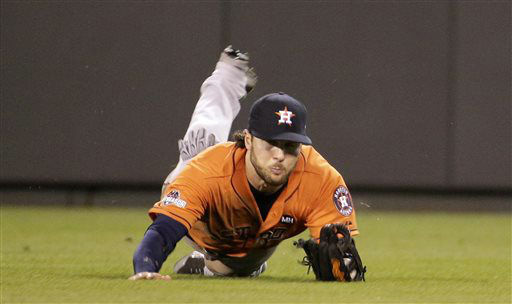 Chris Young served up Springer's home run with one out in the fifth, but tossed four otherwise solid innings of relief. 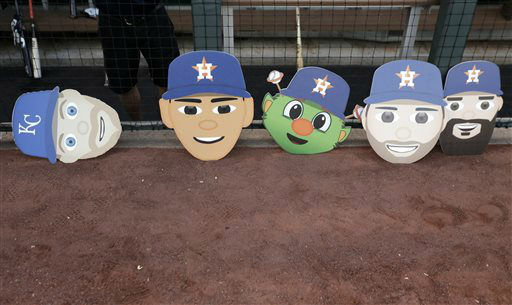 The Astros, who struggled so mightily on the road this season, have apparently solved their woes just in time. They beat the Yankees 3-0 in New York in Tuesday night's wild-card game, then took care of a Royals club built specifically for spacious Kauffman Stadium. 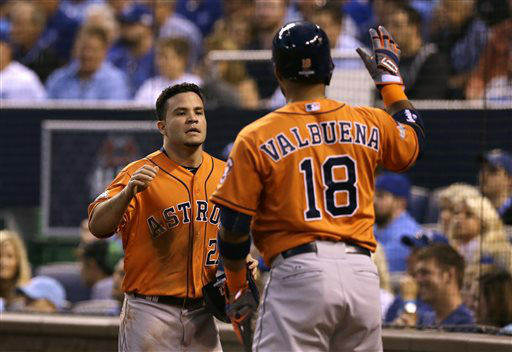 Houston also made it the first time since 1970 that visiting teams won baseball's first four postseason games, STATS said. The other two times it happened were 1906 and 1923. 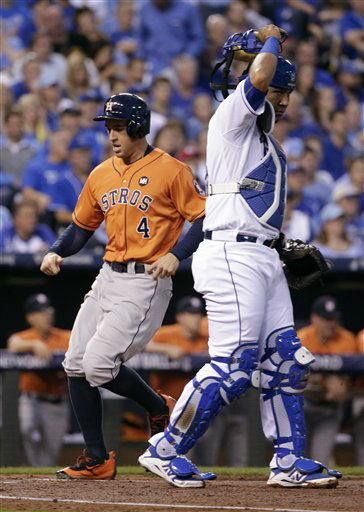 The Astros wasted no time getting Ventura in trouble, loading the bases with nobody out in the first inning. The hard-throwing ace settled down to retire the next three batters, but Rasmus and Evan Gattis provided RBI groundouts to give Houston a 2-0 lead. 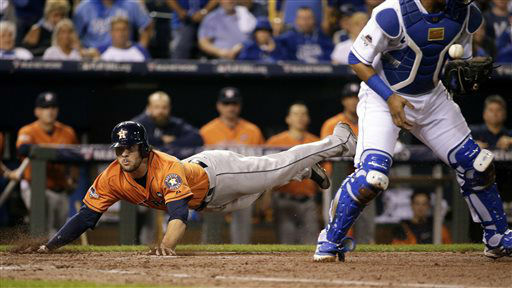 Jose Altuve tacked on another run in the second with a single to right. The Royals answered in the bottom half, just as rain started to fall, when Morales ripped McHugh's 89 mph fastball down the right-field line. The rain became a downpour as the inning progressed, and lightning sent fans scurrying for the concourse. 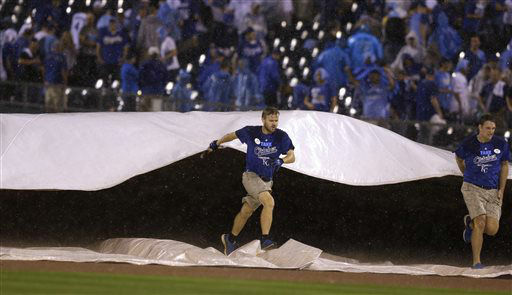 The tarp was pulled onto the field between innings. When the game resumed, the Royals sent Young to the mound rather than Ventura. Astros manager A.J. 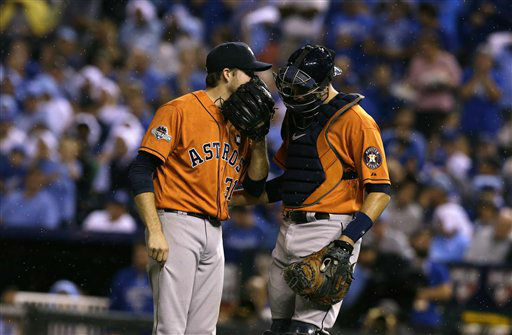 Hinch stuck with McHugh even though he hadn't thrown a pitch for nearly an hour. Morales got the better of McHugh again in the fourth, driving a 1-1 pitch over the wall in right. 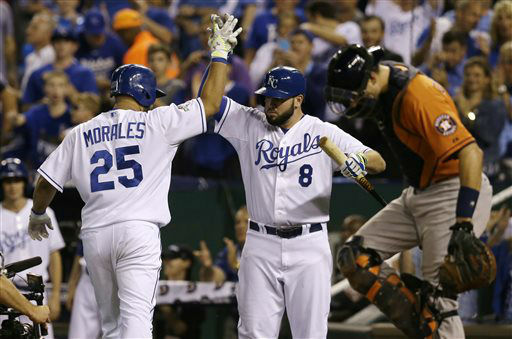 Morales became the first Royals player with two homers in a postseason game since George Brett against Toronto in the 1985 AL Championship Series. 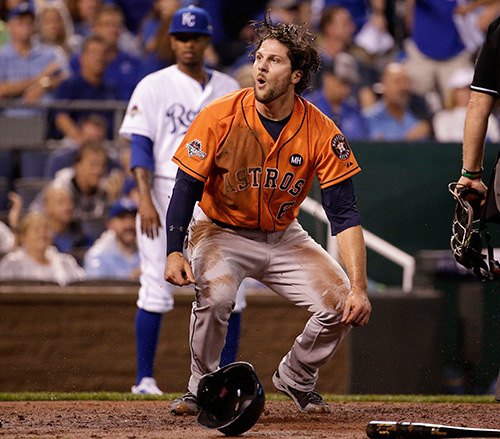 Unfortunately for the Royals, Morales was the only hitter who could solve McHugh. 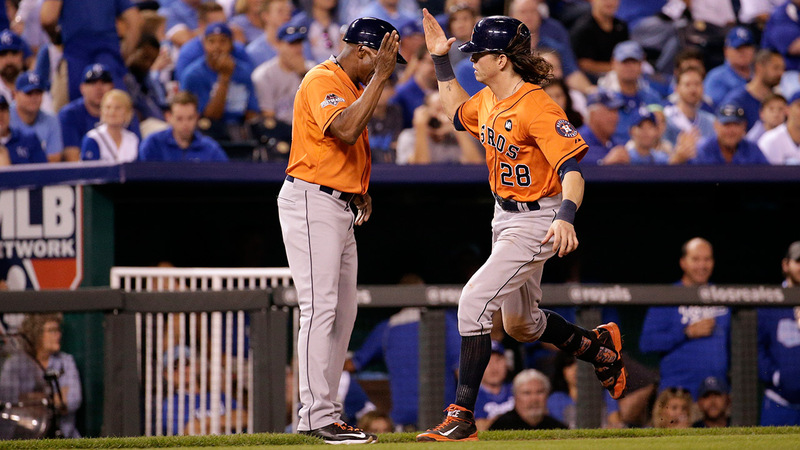 That left the darlings of last year's postseason facing a crucial Game 2 on Friday, when another defeat would leave them on the brink of elimination. 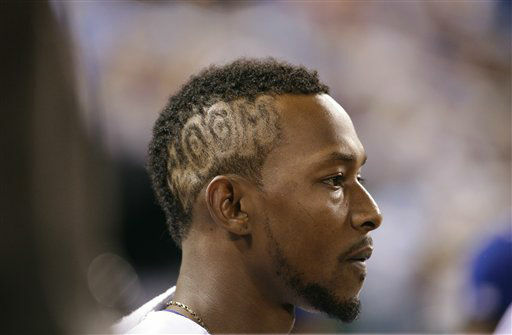 Even the Royals' grounds crew had a rough night. One of the workers responsible for rolling out the tarp during the delay tripped and fell. The tarp kept rolling right over his legs and he screamed in pain. There was no word on the extent of his injury. Two pitchers acquired with October in mind meet in Game 2. The Astros send out LHP Scott Kazmir, whom they received in a July trade with Oakland, to face a team he has dominated in the past. The Royals counter with RHP Johnny Cueto, acquired from Cincinnati a few days later. Cueto has struggled in his previous postseason appearances.